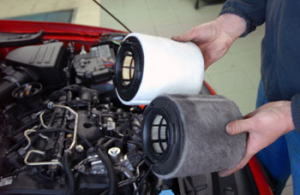 Regular filter replacement is the easiest way to allow your car to breathe freely. Then they added a crankcase filter… and a vapor canister filter… and finally a cabin filter. Lots and lots of filters. And most of them are no longer tied to any other maintenance service. Which leaves you wondering when it’s time to replace those filters. When you bring your car to your local Cottman center, you don’t even have to ask them to check your car’s filters: They’ll check them as part of their regular maintenance service. And, if one or more of those filters needs replacement, they’ll let you know, and give you a price for a high-quality replacement. So stop worrying about how often to have your car’s filters replaced: Just bring your car to your nearby Cottman center, and ask them to handle your regular maintenance. Your grandfather only wishes it had been that easy when he was a young guy!